It might be a bold claim, but Dashlane is one of the best password managers out there. It's extremely powerful and an utter delight to use. The main function of free password manager Dashlane is to offer secure storage for your passwords, and to automatically enter them into logon pages to save you having to type anything. But Dashlane goes beyond this. Even the way passwords are stored is different to the vast majority of other similar programs. As well as the name and URL of a website for which you have saved login details, Dashlane will also display the site's logo to help you identify it at a glance. There's also a Security Dashboard, which analyses your passwords and not only suggests whether they are strong enough, but also highlights instances of potentially dangerous password reuse. If duplicate passwords are detected, Dashlane's password changing feature comes into its own. This is a great way to engage in the good practice of changing your security details on a regular basis. As well as your passwords, Dashlane will also secure your payment details, the personal information you frequently provide to websites, and notes – most of which can be accessed online as well. As an added bonus, it will also keep track of your purchases by storing your shopping receipts. With neat extras such as secure password sharing, and a way to give someone 'emergency' access to your stored data, Dashlane is a powerful and versatile tool. 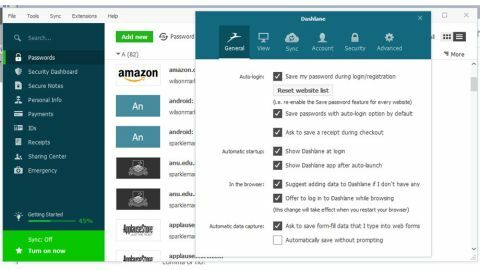 There's no denying that Dashlane is an incredibly powerful tool, but it manages to offer its broad set of features without being intimidating. The interface is something of a masterpiece, and the optional tutorials that appear after installation make it easy to get up and running. Dashlane is often compared to the rather more famous LastPass, and while the premium version is a little on the expensive side, for most people it's likely to be the case that the free edition includes everything you need.